Already a High School Veteran!! Continuing the journey with our ECONO pak! This course includes a very popular hardcover textbook and answer key covering the topic of GEOMETRY. Geometry is the mathematics course being utilized this year covering all the skills needed at this level according to the N.C.T.M. - The National Teachers of Mathematics - A group defining what should be taught at each grade level. And yes, we also send an Answer Key. 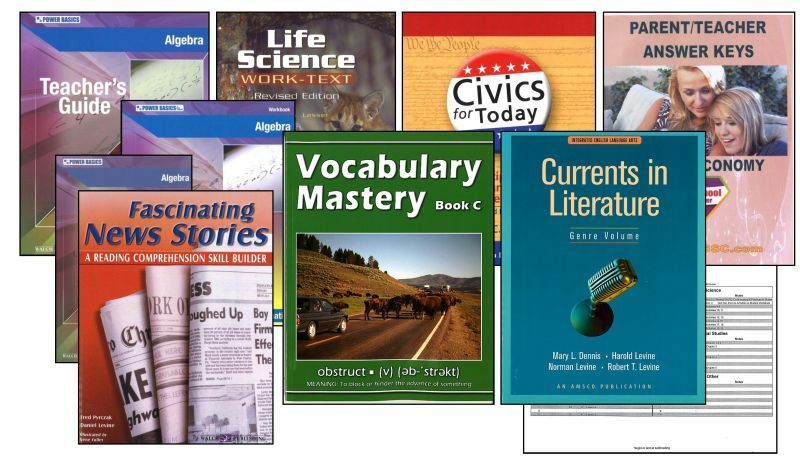 A year of softcover textbook study will ready every student for next year's Algebra 2 program. Are you getting nervous yet? Algebra 2 is on the horizon... you can see it out there - edging up ever-so-slightly. No concerns though... because Geometry is being presented in a full color textbook format beginning with a note to the student that reads: "Welcome to Geometry!... The neat thing about Geometry is that you can draw... on paper... Geometry is not like the math you have done before... give Geometry a chance. You might find you like it!" See? No worries. 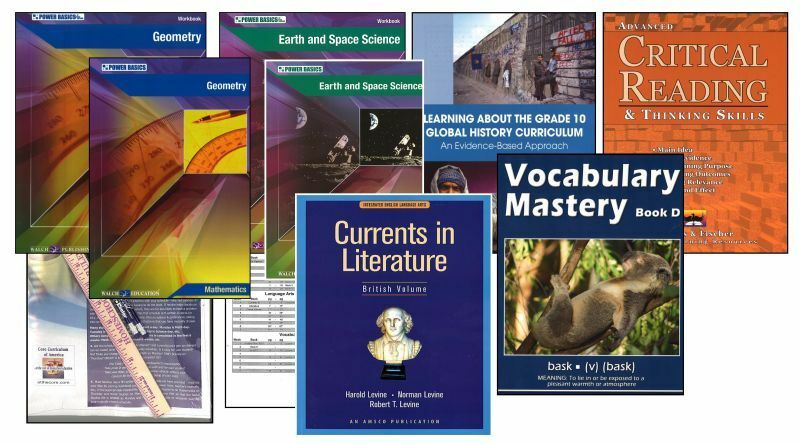 -A set... consisting of a softcover Student Text, a Workbook and an accompanying Test Pack with Answer Keys for all 3 items covering the subject of EARTH & SPACE SCIENCE is here for your student. 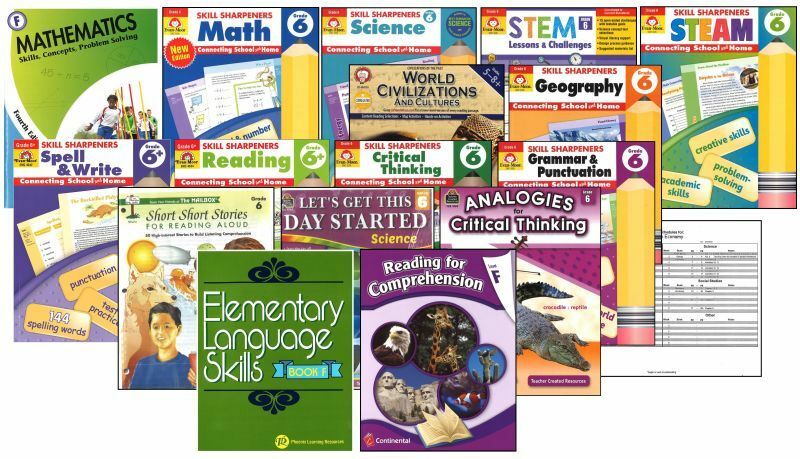 This set covers all necessary, grade level, Earth Science & Space subject matter required like; Planets, our Earth, Plate Tectonics... and plenty more. It's an easy to understand and readily accessible course. And, because it has a write-in style publication to go along with the softcover text - it's more enticing to all students. As always - this science course includes Answer Keys. -We integrated a Softcover Student Textbook set to assist with your student's studies in SOCIAL STUDIES - GLOBAL HISTORY this year. A set consisting of both a Student Textbook and an Answer Key is, with fanfair and forethought (okay not so much fanfare but definitely with forethought) - anyway - it too is placed into this package. 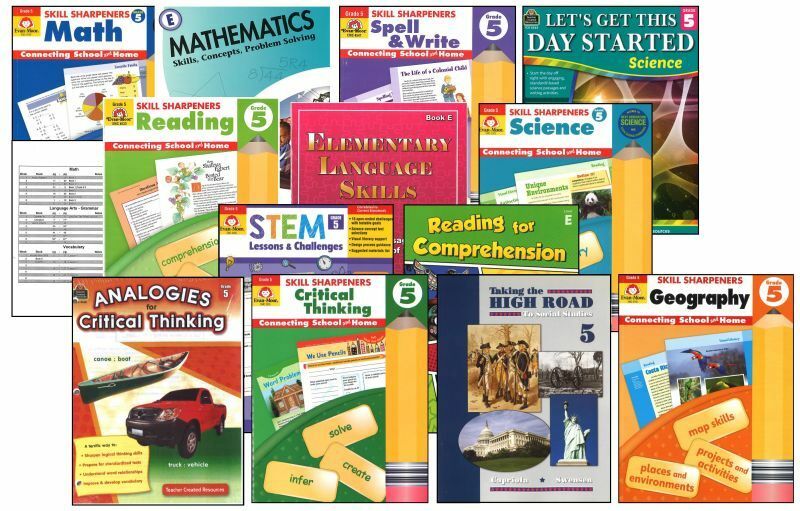 Plenty of 2-color pages of activities, illustrations, test prep, charts and graphs covering the topic of World History are in this softcover textbook set. This is a study of not only history but also includes mapping skills and some geography. It's a complete World history course for the high school level. An Answer Key is included . 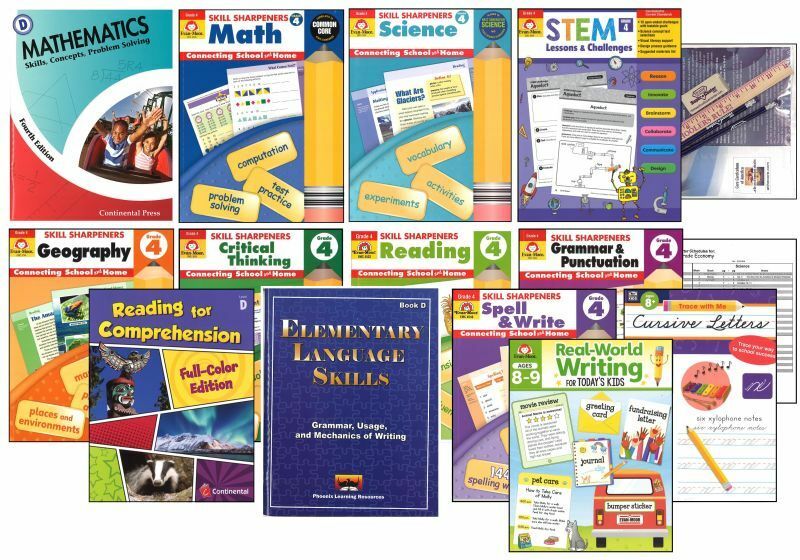 -A LITERATURE - READING - LANGUAGE ARTS workbook set is part of our Language Arts course inclusion. This workbook uses practice exercises to prepare students for standardized tests. Lessons are taught in the context of real literature, so learning is authentic. 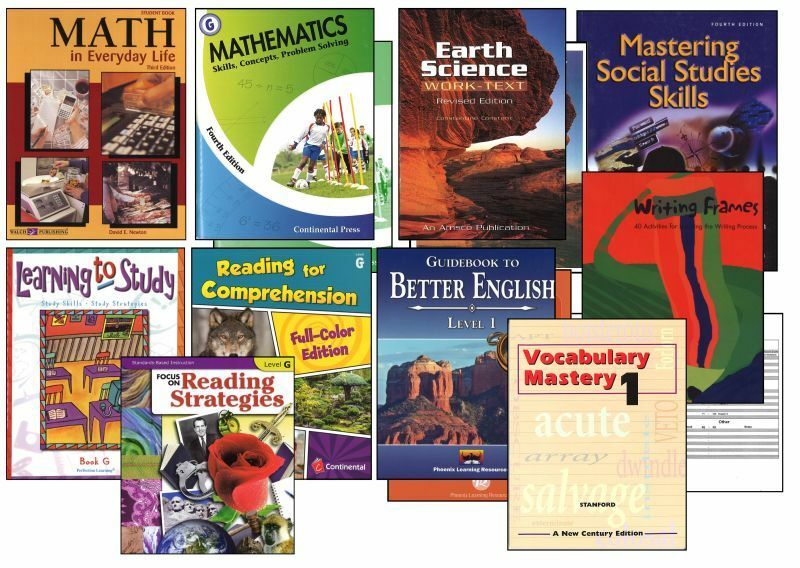 Carefully chosen classic and contemporary literature selections inspire students to become better readers, writers, and communicators - be comforted in knowing that everything necessary for fine tuning your student's English skills at this level is being provided. As always, an answer key is included. An answer key is bound in the workbook itself. All topics covered? Of course! Economy packages contain the bare minimum materials to meet requirements. Parent/teachers should understand that students using an Economy Package need to have additional and supplemental activities added to his/her school day for better understanding and final mastery of the topic(s) presented. Grade 6+ economy packages are typically not suited for a 4 year University-bound student. See the link to the lower left: "Economy? Standard? Deluxe ?"